When I was in my final year at school, I remember being deeply offended by a comment made by a friend. It was around the time that we were all applying to university. I had been incredibly fortunate to receive an offer to study philosophy at Cambridge, and a number of my friends and classmates had also been successful. As we were discussing who was going where, the friend in question observed that I was not the type of person who would naturally get in to somewhere like Cambridge based on talent, but that I only got in because of how hard I worked. At the time, I felt like he was saying that I used a trick to get in and that I didn't deserve it. Or maybe that I wasn’t as smart as the other people who had received an offer, so I shouldn't expect to do very well when I got there. In retrospect, he didn't intend to cause any harm and in fact I've come to see his comment as more of a compliment than an insult. It was only because, like most people, I assumed that natural talent and intelligence are the most important determinants of future success. By telling me that I wasn't as naturally gifted as others in our class, I thought he was telling me that I couldn't be as successful as them. I now know that I was mistaken. I was reminded of this incident once again recently when I read Grit: The Power of Passion and Perseverance by Angela Duckworth. She has dedicated her career to the study of ‘Grit’ and the book convincingly argues that the single most important factor in determining a person’s future success is not how naturally talented they are - it is how much grit they have. As the subtitle of the book suggests, grit is the combination of passion and perseverance that allows people to dedicate long periods of their life to a singular focus, even through extremely tough barriers. It’s obviously related to how much effort and hard work you put into the things you do, but in order to have a high level of grit you must be able to focus on one high level goal for several years. You can’t be working 110% to compete in the olympics one year and then spending all your time starting a tech startup. It doesn’t matter how hard you work day to day if you’re not keeping the same high level goal or purpose on a year to year basis. On one level, it’s obvious that grit is important. Who is surprised by the finding that the amount of effort you put in is important to your final result? What’s new is the understanding that levels of grit are a better predictor of success than many other factors we assume are critical, e.g. how much natural talent someone has. 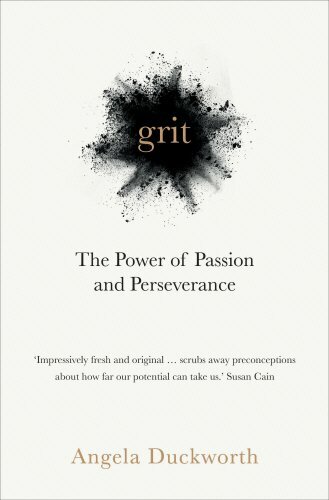 The book is littered with examples throughout of how developing grit is really important and leads to the most successful people doing what they do. From Olympic athletes to spelling bee champions to army recruits - the amount of grit possessed by the participants is one of the most consistent qualities of successful people. I got a score of 4.3/5 which means I score better than about 80% of American adults which isn’t too bad! Still, I could certainly do better, and this book is a convincing argument for why it’s worth it. Fortunately, it is possible to improve your score, and it can go up and down over the course of your life. One interesting thing Duckworth mentions is that older people tend to have higher grit scores than younger people. While this could be because the older generation is made of ‘tougher stuff’, it’s more likely because of the relationship between grit and having a high level goal or 'life philosophy' as one of her interviewees puts it. When you’re younger you’re more likely to not quite know what motivates you most and where you most want to end up. This can lead to the (quite sensible) switching of goals more often when you're young. In addition, an older person is more likely to have experienced some failure or setback and learnt to get back up and try again. So how does one go about developing grit? There are two ways of looking at the development of grit: either from the inside-out, or the outside-in. In other words, you can develop grit in yourself by looking inward and then changing behaviour. Or, you can develop more grit by being part of a good culture which has an impact on you. Interest - You naturally develop an interest in some hobby or area of study. This is where passion is first sparked and which causes you to be captivated. Developing interest is not a passive activity, however. If you don’t yet have a passion or a high level goal then you need to have a guess and then experiment! Go and try something and see how it feels. Practice - People with high levels of grit use deliberate practice to get systematically better at what they are doing. They intentionally stretch themselves and focus on their weaknesses to improve as much as they can. They seek out feedback constantly and then go and try again. The drive to improve is strong in gritty people. Purpose - Passion is key to getting started, but purpose is essential for ensuring continued focus for decades at a time. Gritty people almost always link their work or goal to the well being of others. This could be making the world a better place, helping a specific group of people or being part of something bigger than themselves. They are doing important, meaningful work, which helps them to keep going. Hope - Gritty people are characterised by the fact that they almost never quit and keep persevering for far longer than those with low grit scores. In order to do this, they have to believe that overcoming hurdles and continuous improvement is possible. They perceive failures and setbacks as specific and temporary, rather than pervasive or a reflection of their essential character. (This is the same logic mentioned by Daniel Pink in his book on selling). In addition to the inside-out approach, Duckworth highlights how our environment makes us more or less gritty - what our family life is like and who we spend our time with. We can develop a high grit culture which makes each member of the group more gritty than we might be individually. It is human nature to conform to the behavioural norms of the groups we are a part of (whether consciously or not). When we are part of a team that has a strong set of values then it is possible to internalise those values and make it a part of who we are. By setting very high standards for themselves, but also building a support structure to help them get there, these examples show the benefits of building a gritty culture. What’s your long term, high level goal? How does what you’re doing now tie into that goal? How are you using deliberate practice to work towards that goal? How could you build a culture of grit around yourself? I'd strongly recommend reading the whole thing if any of the above piqued your interest. It's really well written and easy to read, and there's tons of advice for putting each step into practice.